Without chrome the world would forfeit a lot of its lustre. In the finish used for wet shaving accessories it demonstrates its best qualities: The material is corrosion-resistant, very long-lasting and has a luxurious, alluring lustre. When contrasted with this, the colours and shapes of other premium materials are shown to their very best advantage. The high-quality synthetic fibres represent a world first a synthetically produced premium quality whose material characteristics are analogous to those of the precious natural hair, silvertip badger. The majority of the users even say that this quality actually provides better performance characteristics than the natural hair. This elegant shaving set features individually shaped and polished resin handle inserts, complimented with chrome-plated brass fittings. Synthetic Silvertip Fibre Brush - Ideal for lathering shaving soaps and creams alike. These vegan fibres are easy to use and lather up a thicker lather from less cream or soap. Muhle Fusion Razor – The razor features Gillette’s latest precision five blade technology Fusion cartridge razor. The Stand and Lathering Bowl - The highly polished, chrome plated metal stand is perfect for allowing the brush to drip dry and aerate naturally - thus prolonging its life. The bowl is ideal for lathering up shaving creams and soaps. It's also handy for catching any drips from the shaving brush after use. Place some shaving cream or soap into a lathering bowl along with a few drops of warm water and use the brush to whisk up a rich creamy lather. Apply the shaving cream or soap to your face with the brush. When you're finished shaving, rinse the brush thoroughly and the razor, then hang both brush and razor on the stand to let them aerate well before your next shave. 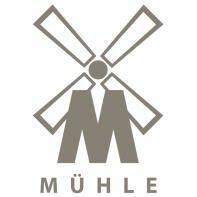 Muhle produce some of the finest shaving products available today. We are great fans of their high levels of workmanship and excellent finish. This set is the perfect gift for both novice and expert wet shaver alike.